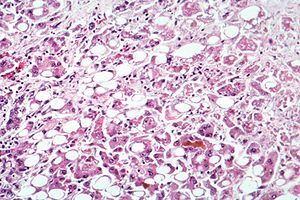 Cirrhosis is a late stage of serious liver disease marked by inflammation (swelling), fibrosis (cellular hardening) and damaged membranes preventing detoxification of chemicals in the body, ending in scarring and necrosis (cell death). Between 10% to 20% of heavy drinkers will develop cirrhosis of the liver (NIAAA, 1993). Acetaldehyde may be responsible for alcohol-induced fibrosis by stimulating collagen deposition by hepatic stellate cells. The production of oxidants derived from NADPH oxi- dase and/or cytochrome P-450 2E1 and the formation of acetaldehyde-protein adducts damage the cell membrane.Symptoms include jaundice (yellowing), liver enlargement, and pain and tenderness from the structural changes in damaged liver architecture. Without total abstinence from alcohol use, cirrhosis will eventually lead to liver failure. Late complications of cirrhosis or liver failure include portal hypertension (high blood pressure in the portal vein due to the increased flow resistance through the damaged liver), coagulation disorders (due to impaired production of coagulation factors), ascites (heavy abdominal swelling due to buildup of fluids in the tissues) and other complications, including hepatic encephalopathy and the hepatorenal syndrome. Cirrhosis can also result from other causes than alcohol abuse, such as viral hepatitis and heavy exposure to toxins other than alcohol. The late stages of cirrhosis may look similar medically, regardless of cause. This phenomenon is termed the "final common pathway" for the disease. Fatty change and alcoholic hepatitis with abstinence can be reversible. The later stages of fibrosis and cirrhosis tend to be irreversible, but can usually be contained with abstinence for long periods of time. ^ a b c O'Shea RS, Dasarathy S, McCullough AJ (January 2010). "Alcoholic liver disease: AASLD Practice Guidelines" (PDF). Hepatology. 51 (1): 307–28. doi:10.1002/hep.23258. PMID 20034030. ^ a b c d e f g h Menon KV, Gores GJ, Shah VH (October 2001). "Pathogenesis, diagnosis, and treatment of alcoholic liver disease" (PDF). Mayo Clin. Proc. 76 (10): 1021–9. doi:10.4065/76.10.1021. PMID 11605686. ^ Longstreth, George F.; Zieve, David, eds. (18 October 2009). "Alcoholic Liver Disease". MedLinePlus: Trusted Health Information for You. Bethesda, MD: US National Library of Medicine & National Institutes of Health. Archived from the original on 22 January 2010. Retrieved 27 January 2010. ^ Mandayam S, Jamal MM, Morgan TR (August 2004). "Epidemiology of alcoholic liver disease". Semin. Liver Dis. 24 (3): 217–32. CiteSeerX 10.1.1.594.1256. doi:10.1055/s-2004-832936. PMID 15349801. ^ McCullough, AJ; O'Connor, JF (November 1998). "Alcoholic liver disease: proposed recommendations for the American College of Gastroenterology". The American Journal of Gastroenterology. 93 (11): 2022–36. doi:10.1111/j.1572-0241.1998.00587.x. PMID 9820369. ^ a b Niemelä, O (February 2007). "Biomarkers in alcoholism". Clinica Chimica Acta. 377 (1–2): 39–49. doi:10.1016/j.cca.2006.08.035. PMID 17045579. ^ a b c Suk, KT; Kim, MY; Baik, SK (28 September 2014). "Alcoholic liver disease: treatment". World Journal of Gastroenterology. 20 (36): 12934–44. doi:10.3748/wjg.v20.i36.12934. PMC 4177474. PMID 25278689. ^ Rambaldi, A; Gluud, C (18 October 2006). "Anabolic-androgenic steroids for alcoholic liver disease". The Cochrane Database of Systematic Reviews (4): CD003045. doi:10.1002/14651858.CD003045.pub2. PMID 17054157. ^ Ferenci P, Dragosics B, Dittrich H, Frank H, Benda L, Lochs H, et al. (1989). "Randomized controlled trial of silymarin treatment in patients with cirrhosis of the liver". J Hepatol. 9 (1): 105–113. doi:10.1016/0168-8278(89)90083-4. ^ Rambaldi A, Jacobs BP, Iaquinto G, Gluud C (November 2005). "Milk thistle for alcoholic and/or hepatitis B or C liver diseases—a systematic cochrane hepato-biliary group review with meta-analyses of randomized clinical trials". Am. J. Gastroenterol. 100 (11): 2583–91. doi:10.1111/j.1572-0241.2005.00262.x. PMID 16279916. ^ Bjelakovic G, Gluud LL, Nikolova D, Bjelakovic M, Nagorni A, Gluud C (2011). Bjelakovic G, ed. "Antioxidant supplements for liver diseases". Cochrane Database Syst Rev (3): CD007749. doi:10.1002/14651858.CD007749.pub2. PMID 21412909. ^ Cederbaum AI, Department of Pharmacology and Systems Therapeutics, Box 1603, Icahn School of Medicine at Mount Sinai, One Gustave Levy Place, New York, NY 10029, United States (March 2010). "Hepatoprotective effects of S -adenosyl-L-methionine against alcohol- and cytochrome P450 2E1-induced liver injury". World J Gastroenterol. 16 (11): 1366–1376. doi:10.3748/wjg.v16.i11.1366. PMID 20238404. ^ Rambaldi, A; Gluud, C (19 April 2006). "S-adenosyl-L-methionine for alcoholic liver diseases". The Cochrane Database of Systematic Reviews (2): CD002235. doi:10.1002/14651858.CD002235.pub2. PMID 16625556. ^ Tilg, H; Day, CP (January 2007). "Management strategies in alcoholic liver disease". Nature Clinical Practice Gastroenterology & Hepatology. 4 (1): 24–34. doi:10.1038/ncpgasthep0683. PMID 17203086. ^ Whitfield, K; Rambaldi, A; Wetterslev, J; Gluud, C (7 October 2009). "Pentoxifylline for alcoholic hepatitis". The Cochrane Database of Systematic Reviews (4): CD007339. doi:10.1002/14651858.CD007339.pub2. PMID 19821406. ^ Fede, G; Germani, G; Gluud, C; Gurusamy, KS; Burroughs, AK (15 June 2011). "Propylthiouracil for alcoholic liver disease". The Cochrane Database of Systematic Reviews (6): CD002800. doi:10.1002/14651858.CD002800.pub3. PMID 21678335. ^ Koretz, RL; Avenell, A; Lipman, TO (16 May 2012). "Nutritional support for liver disease". The Cochrane Database of Systematic Reviews. 5 (5): CD008344. doi:10.1002/14651858.CD008344.pub2. PMID 22592729. ^ Neuberger, J; Schulz, KH; Day, C; Fleig, W; Berlakovich, GA; Berenguer, M; Pageaux, GP; Lucey, M; Horsmans, Y; Burroughs, A; Hockerstedt, K (January 2002). "Transplantation for alcoholic liver disease". Journal of Hepatology. 36 (1): 130–7. doi:10.1016/s0168-8278(01)00278-1. PMC 1837536. PMID 11804676. ^ Dunn, W; Jamil, LH; Brown, LS; Wiesner, RH; Kim, WR; Menon, KV; Malinchoc, M; Kamath, PS; Shah, V (February 2005). "MELD accurately predicts mortality in patients with alcoholic hepatitis". Hepatology. 41 (2): 353–8. doi:10.1002/hep.20503. PMID 15660383. ^ Sheth, M; Riggs, M; Patel, T (2002). "Utility of the Mayo End-Stage Liver Disease (MELD) score in assessing prognosis of patients with alcoholic hepatitis". BMC Gastroenterology. 2 (1): 2. doi:10.1186/1471-230X-2-2. PMC 65516. PMID 11835693. "Alcoholic liver disease (per capita) (most recent) by country". NationMaster. Archived from the original on 21 June 2009. Retrieved 29 July 2009.